Zirroinski has been taken over by the technosapiens. They all go on a rampage and Cyborg protects the citizens from their remnants all around the city. Star labs are also attacked and it’s left up to Sarah to fend for herself as the villains try to assimilate the technology of the lab. Around the globe the villains keep the Justice League busy. 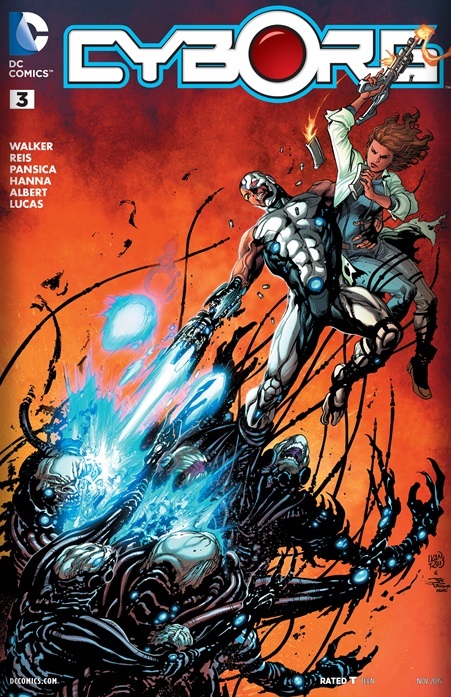 The Tekbreakers who fought the villains in Cyborg #1 show up to aid Star labs problems. Cyborg races there in time to have the leader of the resistance reveal herself to be an alternate reality version of Sarah. This was very action heavy with beautiful art though I found myself wondering if I had missed an issue because things just seemed to progress from 0-100 way too fast for me. The arrival of the metal men was very cool and they stole the show honestly. Perhaps the wait between issues is too long because I found myself disconnected from just about everything that was taking place. It all fell flat and just did not resonate on any level with me. Ivan Reis is doing a bang up job on the art in this book and it’s a real treat from start to finish. The action was also illustrated and choreographed well. Unfortunately this issue is average at best with the art being the real star of the show. To make things worse the finale page reveal was lacklustre and disappointing. ← Captain America and Thor hook up!? Everything that u say here is on point! I thought that there was an issue that I missed. Pacing is off. Arts is well done. I just expected more. Will this series go the same way as Storm?? Let’s see a cast of characters related to our hero develop in an organic way. Why not focus on Sarah to build up to the reveal? I’m not following the plot of the main story well. Though I was the only one Steed! Something is just missing…..even a cliche reveal of an alternate Victor Stone would have been a better go than what we got. I mean was I to care this much about Sarah for this reveal to mean anything??? ?